Shares in panel makers like Trina and JinkoSolar have soared this year. Recent earnings show a long-awaited return to the black now that panel prices are recovering after an 80 pct slump. Profit growth is set to shine, but stock prices look to have gone too far, too soon. Trina Solar on Nov. 19 reported its first profit after eight straight quarters of losses. The Chinese panel maker’s shipments more than doubled to 775 megawatts in the third quarter from the same period in 2012. Trina posted a net profit of $9.9 million, or 14 cents per American depositary share, in the quarter ended Sept. 30, compared with a net loss of $57.5 million, or 81 cents per ADS, a year earlier. JinkoSolar, another Chinese solar panel maker, posted its second straight quarterly profit on Nov. 18. Canadian Solar, most of whose manufacturing operations are in China, reported a third-quarter profit last week following eight quarters of losses. Trina’s stock price is up more than sixfold in the past year, JinkoSolar’s is at nine times the level in November 2012 and Canadian Solar’s shares are around 14 times as valuable. 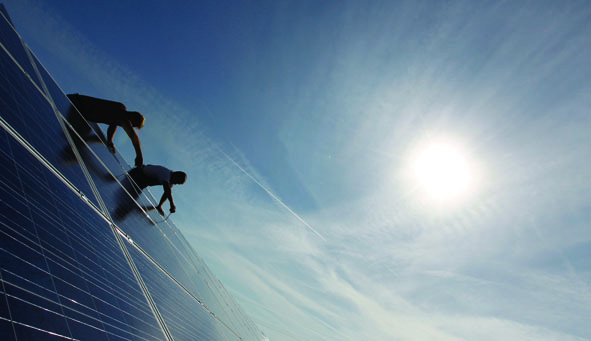 U.S.-based First Solar’s shares have more than doubled in the past year.